Acoma four color pottery jar; This polychrome (tetrachrome or 4 color) Acoma/Laguna jar has two rainbow bands that flow parallel through the design, from the neck down to the lower body, framed by areas th..
Zuni early channel-inlay pin/brooch; This very beautiful brooch is an example of early Zuni channel work, which began in the 1930s. With wonderful design and high-quality lapidary work, this pin exemplifies the b..
Zuni pictorial jar with heartline deer; Formerly in a private collection, this Zuni jar with classic heart line deer has all the charm that one expects of an 1870s Zuni pot. (Deer are sometimes also ..
Navajo Transitional blanket; "Transitional" refers to the period when Navajo weavers begin to weave rugs rather than blankets, in response to changes brought by the coming of the railroad to the Sou..
Panamint pictorial bottleneck basket; In spite of living in Death Valley with its harsh conditions, the Shoshone Panamint Indians wove beautiful baskets. 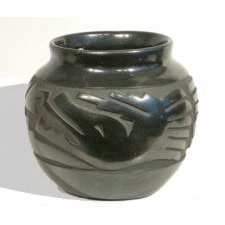 In response to commercial trade which arrived al..
Santa Clara incised pottery jar; This jar was made by Camilio Tafoya. The brother of Margaret Tafoya, Camilio developed the method of incising coiled pottery made out of native clay. This method continu..
Shoshone Panamint basketry bowl; The Shoshone Panamint Indians live in a very hostile environment, Death Valley. Yet, their baskets have always been desired as examples of some of the finest basketry weaving ..
Ute tail or paint bag; The Ute Indians lived in Colorado, Utah, and New Mexico during the 19th century. Being a migratory group on horseback, their clothing and utensils necessarily had to travel ea..
Zuni pottery jar; As Dwight Lanmon and Francis Harlow state in their book, The Pottery of Zuni Pueblo, there were still some potters at Zuni in the 1920s-1930s who were making quality pott..
Vintage Taxco earrings by Spratling; William Spratling, a renowned architect from the US, was drawn to Taxco, Mexico after to Mexican Revolution. He is generally credit with having been the spearhead for the revi..
Brooch by Hector Aguilar; Complex three-dimensional brooch in the form of a rose. Hallmarks indicate it was made at Taller Borda by Hector Aguilar or one of his silver designers. We think there is a st.. Antique American Indian Basketry of Western North American: A Comprehensive Guide to Identification; by John Kania and Alan Blaugrund; photography by Anthony Richardson If you have interest in learning more about Western American Indian basketry, this is the best ..